A perfect example of nice cc ski trails making not-so-nice bike trails. Only worth unloading the knobbies if you are satisfied with riding ultra wide mowed lawns through pretend mountains. Review: Just rode the new Hemerick Point Trail and Eagle Loop along with the refurbished Tenderfoot and Scout Loops and I am thrilled to find rideable singletrack with a bit of flow, rollers and small climbs. I agree with other posts about the old trails at LMSP being mostly wide mowed ski trails, but at least they have recently been maintained and are relatively enjoyable to complete a loop ride. If you are looking for a ride in North Dakota check them out for sure. Review: This is a great trail to hit if you are staying in the area. I try to come up around once a month for camping and biking. The trails in the park consist of mostly wide mowed trail though there is some smaller double/singletrack. It was my first time on the singletrack portion back in May. Look forward to going back. Review: During the fall of 2012, 5 1/2 more miles of professionally built trail were built in the park. The new trails are fun, flowy, and scenic. 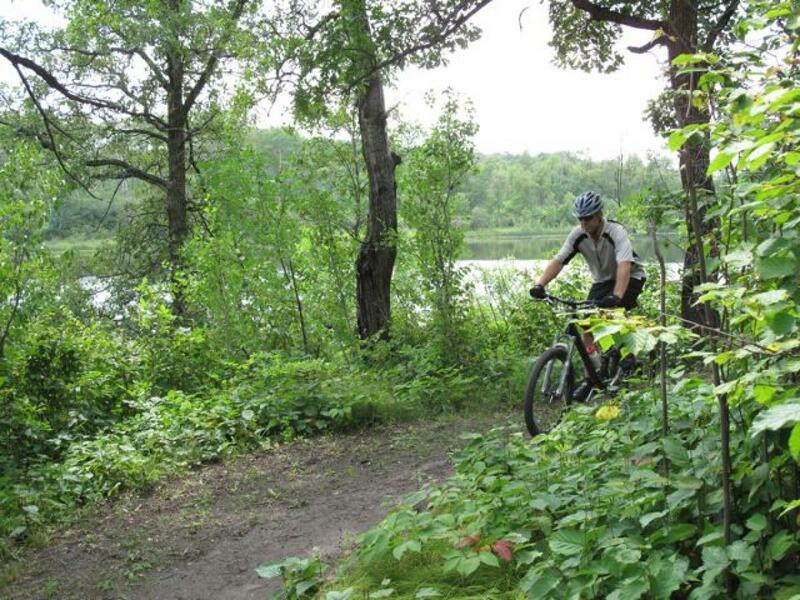 These trails can be enjoyed by anyone with reasonable biking skills. You also do not need a full suspension bike for these trails. I have biked on quite a few professional trails and this one is just as fun as many of those trails. It is worth a ride if you are in the area. Review: This is an update for trails in Lake Metigoshe State Park. Since my last post, roughly 5 new miles have been added. These trails are meant for family adventure. The new trails were professionally made, they are fun, winding, and scenic. If you are in the area they are worth checking out. Similar Trail: Other State Park trails in the state. Review: This trail is mainly a wide multi-use trail. Hiking and biking in the summer and cross country skiing in the winter. Even though most of the trail is wide, there is about one mile of winding singletrack in the old Boy Scout area of the park. This is a great trail for beginners, and scenery lovers. I have ridden this trail many times and am amazed by the beauty of this serene trail. The trail is fairly flat, nevertheless, there are a few short steep climbs. Those looking for a challenging course will have to look elsewhere. Since this was posted the Park added a little over 5 miles of professional trails that twist and turn. The new trail is very fun and scenic. If you are in the area it is worth the ride. Lake Metigoshe State Park MTB Trail 4.00 out of 5 based on 5 ratings. 5 user reviews.